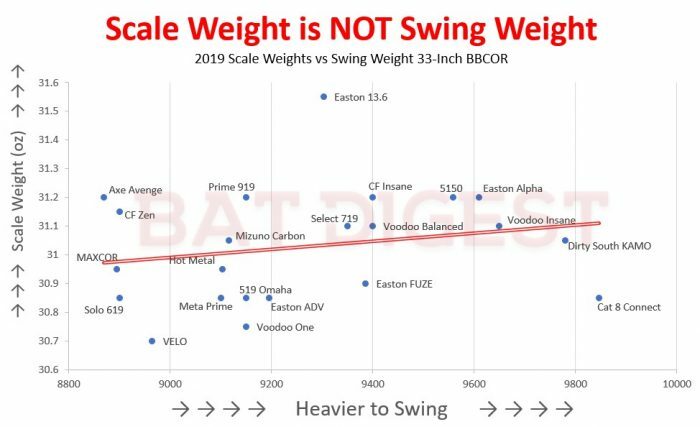 We measured the swing weights of the 2019 and 2018 33-inch BBCOR bats. As a group their swing weight varies no more than 12% total. But, of note, swing weights and scale weights are not well correlated. Swing Weight: A physical measurement of the bat that determines how difficult it is to swing. Based on a few factors including the balance point, pendulum period and scale weight. Misunderstanding the difference between scale weight and swing weight will get you a bat that is not for you. Swing weight is how hard it is to swing a bat and scale weight is how much it weights. As we point out below, those two things don’t correlate too well. Implying a certain feel by weighing a bat is far from understanding the nature of how bats swing. We use the data below, as well as our ball exit speed and barrel size, to write our baseball bat reviews (BBCOR section). This also informs our decision as to the the best 2019 BBCOR baseball bats. The lightest swinging 2019 BBCOR bat is the Axe Avenge. This is surprising to us, and maybe to most. But, Axe set out to make the fastest swing on the market and they did it. The heaviest swinging 2019 BBCOR bat is Marucci’s CAT 8 Connect. This is built for the big hitter looking for all the beef they allow. some surprise is the 2019 Dirty South KAMO real close in the heavy swing weight department. When comparing the 33 inch BBCOR bats we found the Easton Beast X Loaded to swing 12% heavier than the 2018 618 Solo. In practice this is a considerable difference and something that can be felt immediatly. We would guess the 32 inch Easton Beast X Loaded runs 2 to 3% heavier (in terms of swing weigth) than the 33-inch 618 Solo. For two years in a row the Slugger 618 Solo has been the lightest swinging bat we have found. It runs as a single piece aluminum with an extended composite end cap. And, get this, it also comes in a 29 inch bat. That 29-inch BBCOR is the lightest swinging highschool bbcor bat on the planet. It really isn’t close. Other real close options, and within our margin of error are the 2018 DeMarini Voodoo One, the DeMarini Zen Balanced and Easton Ghost X. Do These numbers hold true for non 33-inch BBCOR Bats? Although we cannot be certain, we do believe the numbers translate accordingly when you shift from a 33-inch BBCOR to a 29, 30, 31, 32 or 34-inch BBCOR bat. Meaning, for example, we still think the 618 the lightest swinging 32-inch BBCOR too. The changes between different models and brands are so minute that we think it likely the bats change order rankings—although by some imperceptable amount—as we change BBCOR lengths. But, when compared to non BBCOR bats, we think there little to no correlation between these models and their USABat or USSSA bat comparisons. You can see our analysis on the USABat swing weights here. After measuring the 2018 BBCOR bat swing weights we assigned the lightest swinging bat (Slugger 618 Solo) a score of 1. Then, we took the percentage difference between the 618 and every bat on the list and that number became the index. For example, expect the Easton Ghost X to swing 1.9% heavier than the 618 Solo and the Mizuno F5 to swing 7.3% heavier. Although we are confident in the repeat-ability of our swing measurements, we do not submit they are perfect. Our best estimate is we run no less than 200 points off. Meaning, a percentage swing of 2 to 3% either way would be a reasonable margin of error. As well, a percentage point or two one directly or another is virtually imperceptible to any given player. A bat with a 4% change any given direction on the above chart is likely not noticeable by anyone. where can i find the calculator and or spreadsheet for the swing weight of a bat? Why are the values for the 2018 bats different from the 2019 bats? Would be nice to be able to compare the two lists. You can on our exit sheet data page. Little confused. You said the axe avenge is the lightest swinging bat. But then it’s not listed under The Lighedt Swinging BBCOR Bat. Please clarify thanks! This page has yet to be updated since we did our swing weights just a few months ago. Those are 2018 bats in the list. 2019 in the header image. Thank you for putting up this info. It is super helpful and, as you know, pretty much impossible to find anywhere else. Would you be willing to include a link to the 2018 swing weight data you had previously posted? It would be interesting to compare between years. Thanks Mike. And so true. The data is below the data. You do have to do the “like” thing, but it should show up. Let me know if it doesn’t. How does the Marucci Posey BBCOR rank in among these bats? The Marucci Posey BBCOR is the same bat as the CAT 7. So it ranks exactly similar to that, but with a different paint job. So does swing weight translate to wood bat turn models? With wood bats I am used to seeing balanced defined as a 110 turn, a little end loaded defined as a 271, and a lot end loaded defined as a 243. Do these wood turn models correlate to swing weight in this evaluation? When buying a wood bat, the 271 and 243 turn models get marketed to power hitters or hitters looking for more power. Where as with composite bats it seems like the marketing hype is all about being “balanced” which sounds like a 110 turn to me. Great Question Dave. And you are right. Turn models have an inherit swing weight to them. Mostly because the bat’s shape, ie turn, derives where the weight of the bat sits. And a bat with a higher swing weight will have a balance point more towards the end cup. These models, sold more towards power hitters, will have a balance point closer to the end. If you want to tell the difference, without all the calculation, one useful way to determine the swing weight of the bat is by measuring the balance point. You do that by just balancing it on your finger. Mark the spot. Then compare that number to another bat’s balance point. Most often, the one with the balance point further away from the knob will be a heavier swing weight. Why does the price go up whn ther bat is pretty much the same ?